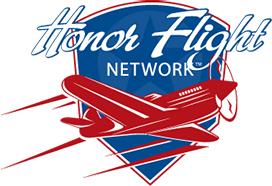 The newest initiative of Honor Flight, conceived by Dave Bauer, a Vietnam Veteran and a recipient of the Purple Heart, is “Flags of Our Heroes”. It is our desire to show the respect so richly deserved to our deceased veterans and their families. Even though they will never see their memorial, we want to provide the families with the opportunity to know that their family member was shown the highest regard and respect at their memorial. In order to do this, Honor Flight Philadelphia would obtain from the family and/or friends of the deceased veteran, the ceremonial American Flag that was presented to them during the funeral. We would then place the flag in a shadow box and take a 5 x 7 photo of the veteran and a copy of the obituary notice, if available, on one of our trips to the memorial in Washington, D.C. The veteran’s flag, their photo and items would be placed in front of their memorial and a photo taken. The family would then receive an 8 x 10 framed photo and a certificate from Honor Flight honoring the veteran. All items taken to Washington would be returned to the family after the trip. If you are interested in honoring a deceased veteran from your family in this way, please contact Honor Flight Philadelphia at Andrew@honorflightphiladelphia.org by phone at 610.662.1812.